In order to catch crabs, you will first need to learn how to catch them. This section will discuss the various methods used by sport fisherman (that would be you) to catch crabs. I listed four such methods, but there are probably more ways to catch crabs. Which way you catch crabs is up to you. This is by far the most common way to catch crabs. It involves tying a long rope between a baited trap (you can have up to 2/person) and some secure place on the shore. This is usually done on a floating dock or a pier because you can access deeper water. Secure place means some thing that won't be moved by the force of the trap dragging the rope while it falls. The bait is secured to the trap by a piece of wire going through the bait. The trap is then thrown into the water. You wait a certain period of time before you pull the trap up (amount of time depends of the type of trap you use) and examine what you have, or not have caught. Warning: Make sure that you secure your trap(s) to some place secure before you throw the thing in the water. You may loose the trap if you don't. Don't try to hold the rope in your hand or tie it to any part of your body to secure the trap. The trap might pull you into the water. The illustrations below show the correct and incorrect way to deploy a trap. The advantages of this method is that it is widely used. This means that you can easily obtain equipment and there will be a lot of other people at crabbing spots for you to ask questions at. The disadvantage is that since a lot of people catch crabs using this method, you will have trouble finding a good crabbing spot that isn't crowded. This is basically the same thing with the previous method except for that you secure the traps to buoys/floats and throw the traps from a water transportation (e.g.. a boat). Don't tie your lines to the boat unless you want to wait at the spot you put your trap. The buoys/floats enable you to find and retrieve your traps. The advantages of this method is that you don't have to compete with the people on shore and deploy your traps in spots they can't reach. The disadvantages are you need to pay more for your equipment and do maintenance on the boat. If you think all that stuff about traps and all the other stuff is too complicated, there is a simpler way for you. This method involves you going into the water and find crabs yourself rather than waiting and see what walks into your traps. Since trying to catch crabs with your bare hands, in their environment, is dumb and may turn out to be painful for you, you get to use something called a dip net. People who have fish as a pet know what this is. 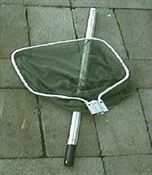 A dip net is a net with a usually circular frame and a handle. You will probably need a bigger net than most ones used for household fish tanks. If you don't like to get wet, there are alternatives. 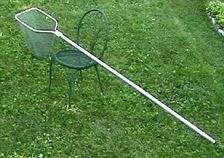 You can use a dip net with long handle (pictured above) to net crabs from a boat. Another alternative is that you can use a fishing reel in combination with a dip net. You'll need to be close to water (e.g.. on a boat) to do this. When you feel the crab's pull on your line, reel the line slowly (crabs are going to let go if you do it too fast). When you can see the crab, scoop it up with the dip net. Don't pull the crab out of the water with the reel. As soon as the crab feel that it is out of the water, it lets go. There are also a number of products that are designed to catch crabs in conjunction with the fishing reel, so you can use those too. Being extremely simple is this method's main advantage. You also control what you catch, rather than wait and see what comes into your traps. A dip net also cost less than all the things needed to deploy traps. The drawback is that the area you can catch crabs in is limited by how well you can swim, dive and hold your breath if you go into the water and short reach if you use a dip net from a boat. It is legal in British Columbia for a person to dive for crabs. You can use scuba equipment to assist in diving. Like using a dip net, you have complete control of what you catch. The drawback is this method's cost is probably pretty high. This is just something that you can try, but most people don't bother with this.